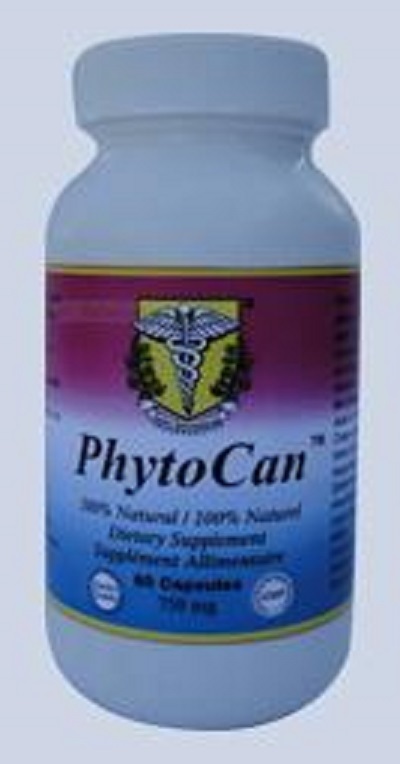 PhytoCan (750 mg, 60 capsules)- Save-On Nutrition Centre Ltd.
PhytoCan is the synergistic combination of botanical extracts from oriental well-known anti-cancer herbs which are widely used for cancer therapy. Century’s old usage of those herbs for food and drink in China, Korea and Japan, plus documented basic research and clinical application has further verified its usefulness and safety. PhytoCan is created and formulated to maintain its function by a team of scientists and physicians after many years of cumulated research with initial clinical application in 1995. Induces apoptosis of malignant cells without harming normal cells. Apoptosis is characterized by chromatin condensation and DNA fragmentation. The unique compositions contain certain oriental medicinal herbs. Extensive testing indicates PhytoCan is effective when used in combination with radiotherapy or chemotherapy. Enhances the carcinocidal capacity of other chemotherapeutic agents and also can reduce the side-effects from chemo or radiotherapy. Increases the activity of NK cells, and reduce and prevent metastasis of tumors. Effective for chemoprevention of cancer and other malignancies. Medical Ingredients: Botanical extracts from Scutellaria barbata D.Don, Hedyotis diffusae wild and Lobelia chinensis lour with polysaccharides and bioflavonoids. Suggested Dosage: For cancer treatment, take one to three capsules with each meal or directed by a physician or health care professionals.